He was born Samuel Veronneau in the spring of 1847 just south of Montreal, Canada, in the small town of Coteau du Lac, to Pierre Veronneau and Elizabeth Rose Belleville Baltazar. When he was just two years old, his parents moved the family 130 miles up the St. Lawrence River to start a new life in the United States. 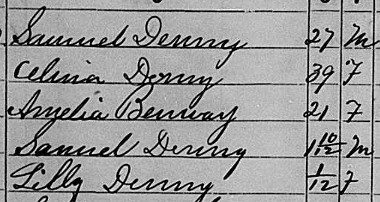 The first record of the family in New York is the 1850 census where they are now known by the Americanized surname Denny -- derived from Veronneau dit Denis. At this point, not much is known about Samuel other than what we can glean through a handful of vital records. No military service has been found -- he would have been 15 years old at the onset of the Civil War and 18 at the end of the conflict. Samuel made his living as a laborer, lumberman, and eventually a river guide. He married widower Salina Belan Benway, 16 years his senior, sometime around 1874. The couple had two children, Samuel, Jr. (1873) and Lilly (1875). For a time around 1880, the family lived in Oconto, Wisconsin, just north of Green Bay, where Samuel worked as a lumberman. The reason for this move to the midwest was most likely to the desire for Samuel's wife, Salina, to be close to her oldest child, from her first marriage, Jennie Benway. (Note: Salina had been married to Ziba Benway, who died in 1865 after his Civil War service). 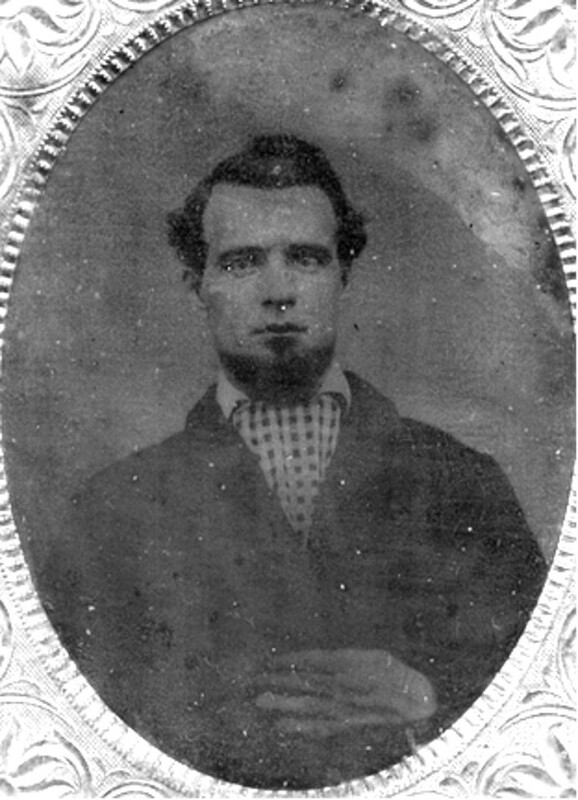 Jennie married Charles Collier and had been living in Wisconsin since at least 1874. At the time Samuel and his family moved to Oconto, Jennie had three small children and it's quite possible that Salina had never met any of her young grandchildren. It is not clear how long they stayed in Wisconsin, but by the 1900 census they are back in Clayton. He died in Clayton on September 15, 1915, just a week after the first birthday of his granddaughter Geneva. 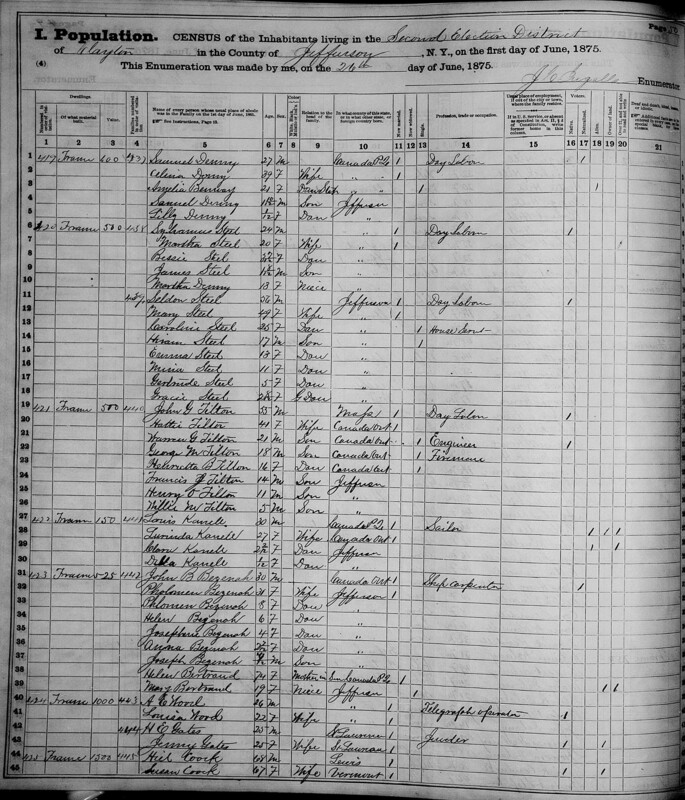 1850: The first record of the Denny family in New York shows up in the 1850 Federal Census conducted in September of that year. 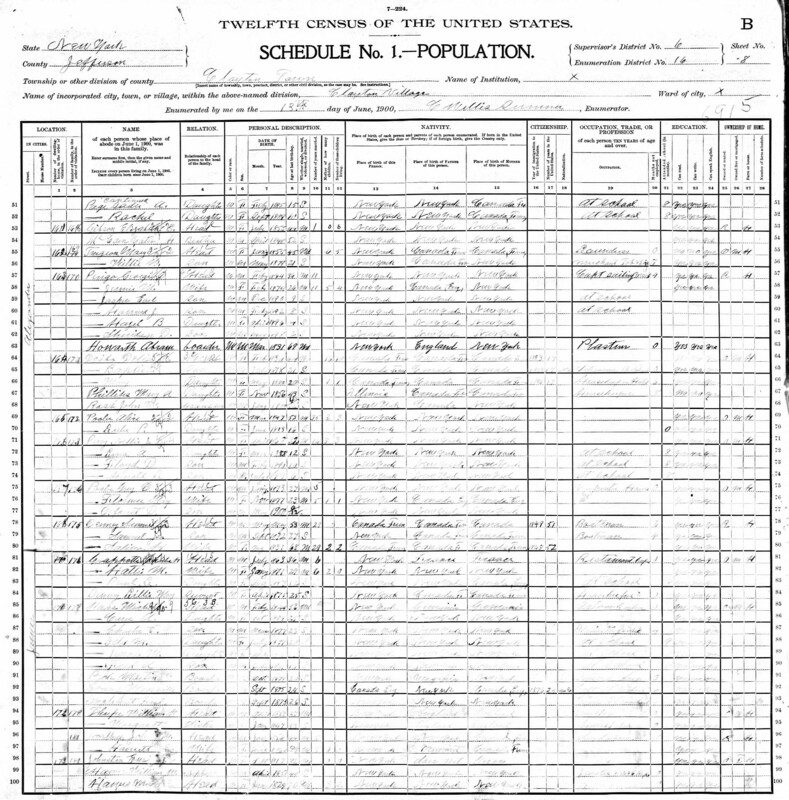 Peter, Rose and the children are living in Clayton, but little information is included in these early census records compared to their 20th century counterparts. 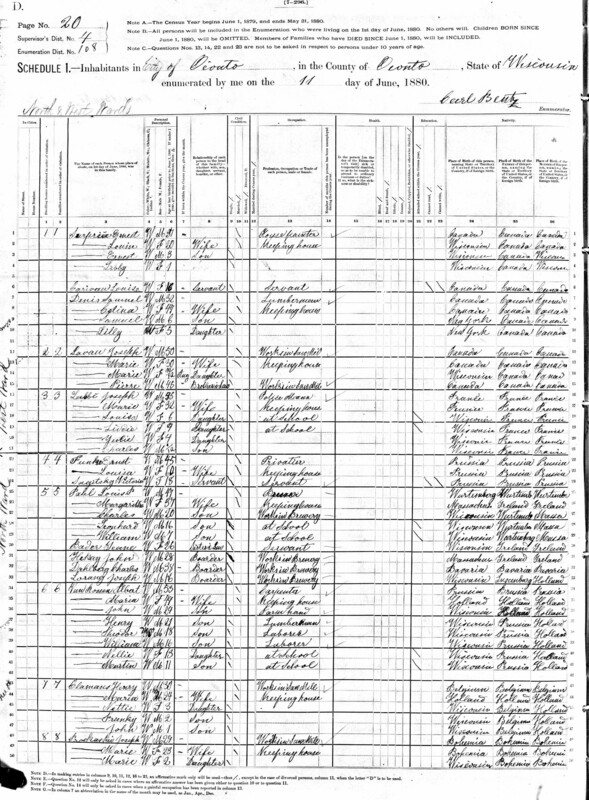 As you click on the image (and expand it to its full size in a new window) you'll see Peter reporting his occupation in vague terms as "laborer" and indicating that he and Rose were both born in Canada. It's interesting to note that they report all of the children as being born in New York, although it's clear that Peter, Leander, Henry and Samuel were all born in Coteau du Lac. Perhaps it was an oversight, or it could have been an attempt to establish citizenship, even though no proof was required by the census taker. 1875: The second child of Samuel Denny and Salina Belan is born in Clayton. 1875: Samuel and Salina living in Clayton with their two young children and one of Salina's daughters, Amelia Benway, from her first marriage. New York is one of the states with their own census that was conducted every 10 years, 5 years apart from the federal census. Sam indicated he is working as a "day laborer" and also that he was born in Canada and has become a naturalized citizen of the United States. 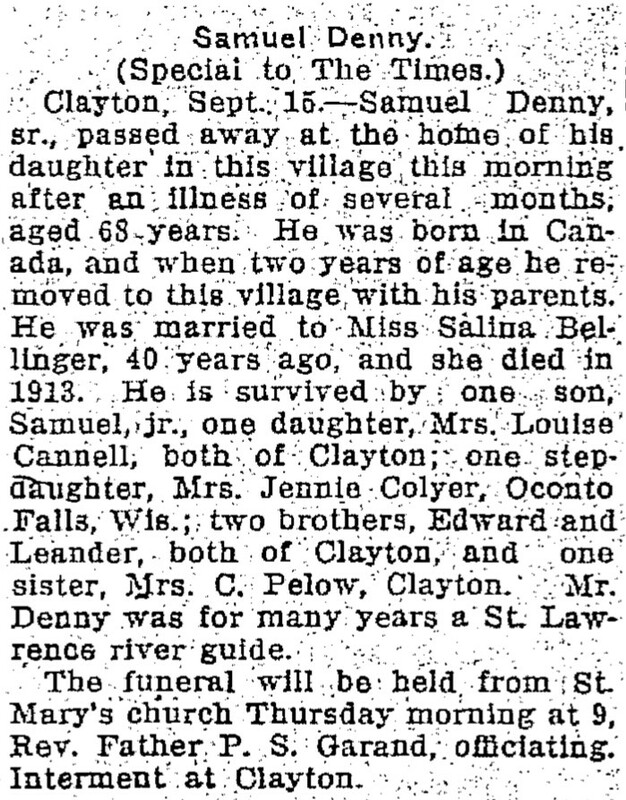 1915: The newspaper article below from the Wednesday morning, September 15th edition of the Watertown Daily Times gives us a little more insight into Sam, Sr.'s life. 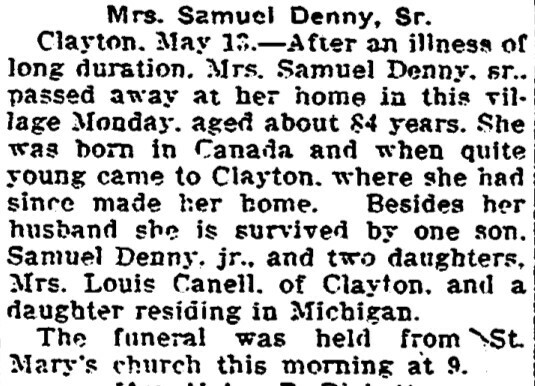 Death of Samuel Denny, Sr.
Newspapers are a great source of information, but when it comes to obituaries, they are often filled with inaccuracies. The most glaring error in this case is the information about his wife, Salina "Bellinger". Her actual maiden name is Belan and it later became Benway (from her first marriage 1847-1865), so where "Bellinger" came from is a mystery. The article also states that Salina died in 1913, when in fact it was 1914 (as published in the same newspaper!). We learn that Samuel's daughter Lilly was married to a man named Cannell, although the extra "e" on the end of Louis would lead you to believe that her name was Louise instead of Lilly. 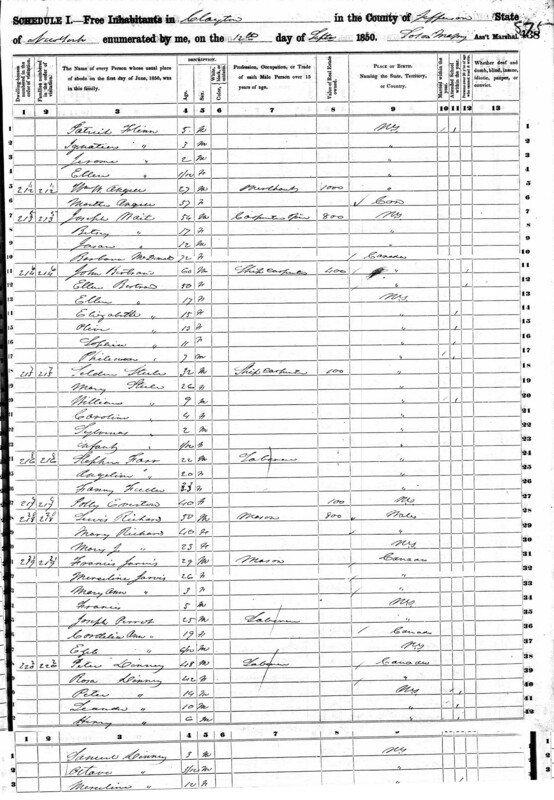 We also see that a connection to Wisconsin still exists at this point in time with Salina's daughter Jenny (from her first marriage to Zeiba Benway) residing in Oconto Falls. Materials Needed -- You Can Help!